Parrotlets may look like little green parakeets, but they are not priced like parakeets, nor do they share the same temperament. At 5 inches in length, they are also a couple of inches smaller than parakeets. 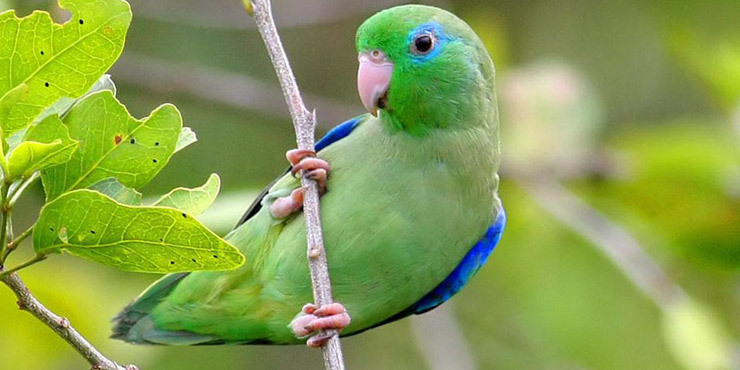 There are several species of parrotlet, but only two are commonly found in the pet trade, the Pacific parrotlet (Forpus coelestis) and the green-rumped parrotlet (Forpus passerinus). The Pacific Parrotlet (Forpus coelestis) has become one of the more popular small birds in the country, and is the most common of the various parrotlet species. Originating in Mexico and Central and South America, these “pocket parrots” have caught on fast. They have the personality of a “large bird in a small bird’s body,” and are often compared to Amazon parrots, a family of parrots said to be their close cousins. Indeed, they do resemble the Amazons, with short, stout bodies and a somewhat blunt tail. The male is green with a blue streak behind the eye and blue on the rump and wing-coverts. Females lack the blue colouring, and may or may not have a faint blue streak behind the eye. Pacific Parrotlets are not noisy birds, making them great for people living in apartments. They will repeat words and simple phrases, but are not known to be the finest talkers of the parrotlet family. Pacific’s are very spirited, and can become aggressive if left for too long without handling. Even though it is tiny, do not underestimate the strong beak – its bite is much stronger than a budgie. Do not underestimate the strong beak – its bite is much stronger than a budgie. The next most popular species is the Green-rumped parrotlet (Forpus passerinus), which is the smallest of the group. Like the Pacific, the males have blue on the wings and the females do not. They are a little gentler than the Pacific parrotlet, but may take a longer time to acclimate to new surroundings. This species might be better for the parrotlet novice. Parrotlets in the wild can be found in Mexico and Central and South America. Parrotlets in general are feisty, affectionate, and willful. 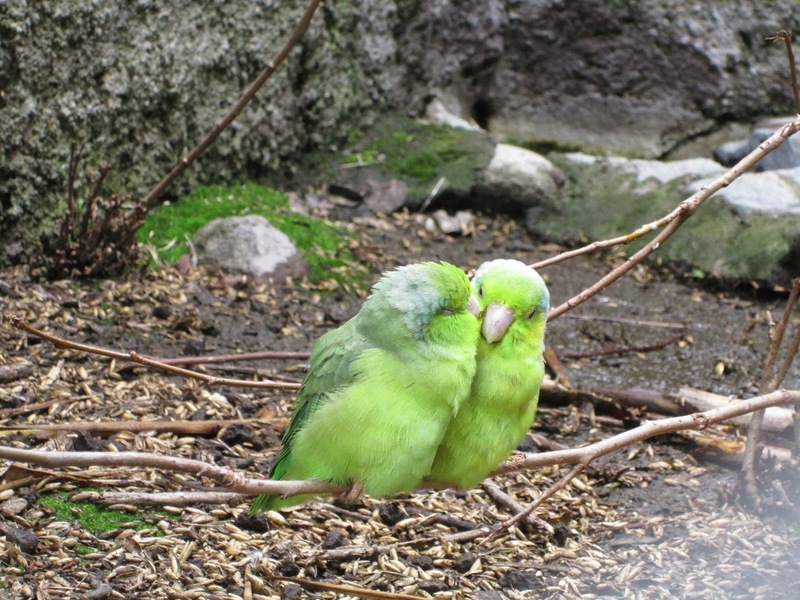 If someone wants a great companion they should keep only one bird, because a pair of parrotlets will probably bond closely to each other to the exclusion of the owner. However, parrotlets are dimorphic and easy to pair up, and they do enjoy each other’s company. They can also be kept peaceably in groups in large aviaries, but it’s best to keep them separate from other species. They will quibble and fight over object and territory, so keep that in mind. Males and females make equally good companions depending on the individual. Companionability has much less to do with gender than it does with handling and socialization. Hand-fed parrotlets are very friendly, especially if the guardian takes the time to keep handling the bird. If left alone for too long, a single parrotlet can lose some of its companionability. The Pacific parrotlet, in particular, does not understand that it is a tiny bird, and has little trouble challenging other animals and humans.